Our Try Dive Scuba experience introduces you to the thrill of scuba diving under the supervision of a Professional diver, in a safe confined environment, usually a swimming pool. 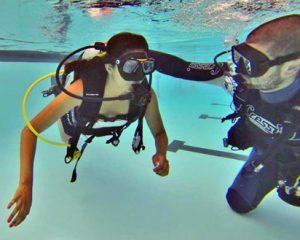 During your adventure you’ll master some of the basic concepts and scuba skills but more important you WILL have fun. When you participate in a Try Dive Experience, you discover excitement and adventure – freedom and serenity. Nothing compares to the “weightless” exhilaration of breathing underwater. Only a diver knows the feeling! After checking the Try Dive Brochure and a short safety briefing you’ll enter the water and be ready for your scuba adventure. We allow 30 minutes before the session for the preliminaries and then you will be in the pool for about an hour. Dive straight in to the PADI Open Water Course, it’s the most recognised and respected Scuba Diver training program in the world.